In 2014 and 2015 Fintan Walsh of IAC directed a series of archaeological investigations at Knockhouse Lower in advance of industrial development. The site, which is on the western outskirts of Waterford City, had been tilled for many centuries and prior to the excavation no above-ground monuments were visible. 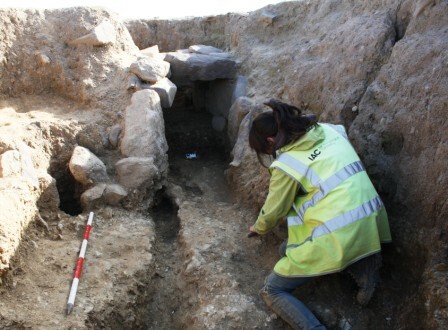 However, methodical and painstaking archaeological excavation revealed the remains of an early medieval ringfort. Some evidence was uncovered for the former existence of structures within the ringfort, including two souterrains (underground storage or hiding places). The ringfort was associated with a series of field boundary ditches which radiated from it as well as a number of contemporary cereal drying kilns. Evidence for earlier prehistoric activity was also uncovered, including Bronze Age fulachtaí fia (burnt mounds) and settlement activity dating to both the Neolithic and Bronze Age periods. Fintan’s illustrated lecture will give a comprehensive overview of the results of the excavations at Knockhouse Lower.